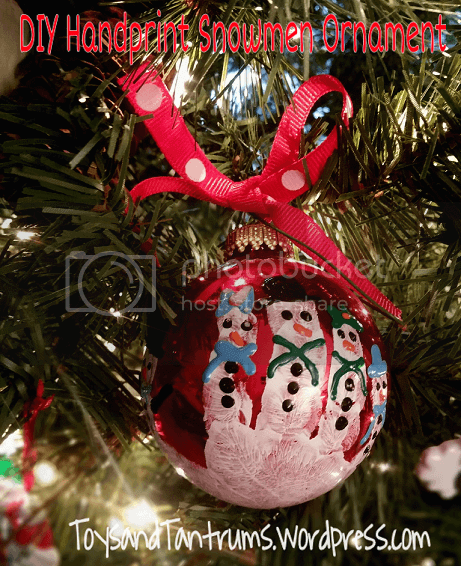 DIY Handprint Snowman Ornament craft from Christina Hood who blogs at Toys and Tantrums. We love this!! One of the first Christmas traditions I started when I had Jaxon was making a keepsake ornament each year for the tree. I regretfully didn’t start until he was two, but better late than never I suppose. The DIY Handprint Snowman Ornament is the first one we made together and it’s super easy to do. *Ribbon for hanging, or you can use a traditional tree hook. Take your childs hand and paint it with the white acrylic paint (don’t worry it washes off fairly easy). Have your child open their hand and lay the ornament in their palm. Have them gently close their hand around the ornament (you may need to help them with this step) let the paint dry for 15 to 20 minutes. Once the paint is dry, you can start adorning your little snowmen. You can put hats on some, bows on the others…whatever your heart desires. Be sure to write your child’s name and the year so you can reminisce with ease throughout the years. We loved these so much we made some for the grandparents tree, they love receiving our homemade ornaments each year, it’s far more special than anything you could ever buy at a store. This is a guest post by Christina Hood from Toys and Tantrums: I am a stay at home mom of 2 boys so I love doing things that keep them entertained. I also love to try new recipes and create my own that are kid and husband approved. I love DIY projects and crafts, and love sharing my ideas with others. There’s great satisfaction in knowing you’ve created something yourself, and essentially saved a ton of money by doing so.